Scottish Region Sulzer Type 2 Action. The Sulzer Type 2 family of diesel locomotives consisted of classes 24 to 27 inclusive. The 24s and 25s were of British Railways design whilst the 26s and 27s were designed and built by the Birmingham Railway carriage and Wagon Company of Smethwick. This was all part of the 1955 modernisation plan, which involved the replacement of steam locomotives on British Railways. The diesel power unit in the type 2 locomotives was the Sulzer 6LDA28 (for 24s and 26s) of 1160 horsepower and the uprated 6LDA28-B of 1250hp for classes 25 and 27. 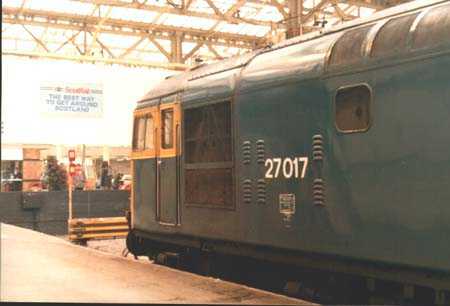 The electrical equipment for the 24s was manufactured by British Thomson Houston (BTH) who were later absorbed by Associated Electrical Industries (AEI) who had supplied the electrical equipment for the class 25s. Crompton Parkinson supplied the equipment for class 26 and the General Electric Company (GEC), or at least I think that is what GEC stood for!, supplied the equipment for class 27. It can be reasonably argued that of all the suppliers Crompton Parkinson were the best and also the most expensive. 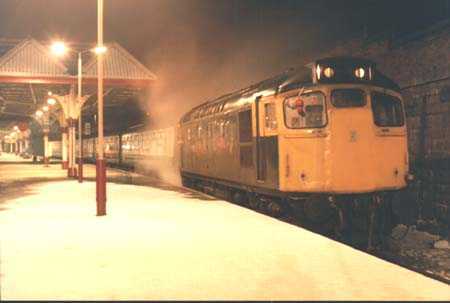 Indeed their equipment was supplied for BRCWs type 3 design, the class 33, which owes its conception to the class 26. On this and the next couple of pages we take a look at classes 26 and 27 at work in Scotland, where they were based for the majority of their lives. Most of their work involved passenger turns all over the Scottish Region together with the odd foray south of the border, notably to Carlisle. 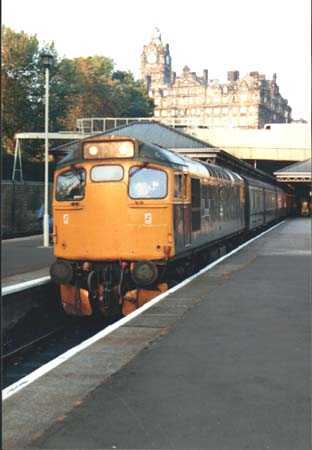 Several class 27s spent a lot of time working Edinburgh - Dundee services, operating hourly from both Edinburgh and Dundee and nicknamed "The Circuit". A considerable amount of mileage was obtainable providing all went to plan! The last trip from Dundee is depicted below with 27018 waiting to leave with the 2130 to Edinburgh, again on 22nd February 1986. For a short time local evening services out of Edinburgh went over to locomotive haulage such as the 1805 to Cardenden, seen below on 24th September 1986 with 27052 in charge. 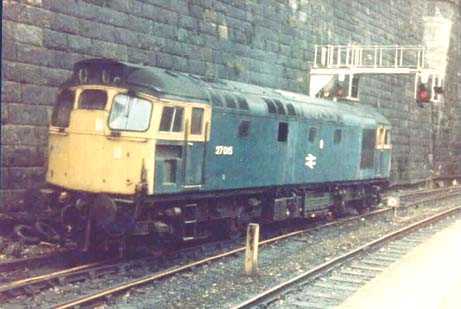 A few members of Class 27 were withdrawn during the 70s, including 27015, seen here at Glasgow Queen Street on 27th September 1976, the locomotive was withdrawn just over two months later. Photo courtesy of David Hills.